CHATAN, Okinawa — In 1945, Francis “Duke” Wieden found a photo album buried in the sand on an Okinawan beach. It was a curious find, given the devastation of war on the island, and one that struck a chord with the young Navy officer. Almost seven decades later — and two years after Wieden’s death — his family assembled outside the Irei Associatation meeting hall here, excited and tense as they waited to go inside to greet the family of the album’s owner. The two families would finally meet. Andy Anderson said Duke Wieden had a big heart and a bigger smile. He once told Wieden’s second wife, Carolyn, that Wieden greeted wounded soldiers on the beach with a cheeky grin, telling them that they were only 10 minutes away from the hospital ship Hope — home of the best doctors and prettiest nurses. The USS Latimer had offloaded the troops of the 96th Infantry Division onto beaches Brown 1 and 2 — where Chatan, Okinawa, is now. Wieden was among the soldiers and sailors who came ashore after a heavy shelling of the area. He spotted the soggy, sandy album, filled with pictures of a family, children and friends. No one knows how it got there. Anderson would later explain that Wieden was grievously upset by his find. He wanted to return it to its family, knowing that the photos could be the only record of happier times. Just three weeks earlier, he had been overjoyed to learn that his first son, Dan, was born in Portland, Ore. Carolyn Wieden said she believed the fear that he might never meet his son drove him to be so protective of the album. Wieden brought the album back to his bunk on ship and eventually, back to his home in Oregon — where he never spoke of it again. Air raid drills were common on Okinawa; families were taught that suicide was the best option if they were cornered by Americans. They were told they would be issued two grenades — one for the enemy, one for themselves. Masako “Iha” Sunabe’s older sister, Mitsuko, was in charge of getting a group of residents to a predetermined safe area, but drowned almost six months earlier while crossing a river on the way to safety. When the sirens sounded on April 1, 1945, 15-year-old Iha had only enough time to grab a few handfuls of brown sugar cubes for sustenance and run for the hills with her family. When the shelling began, Iha and her family were fleeing to the north, the start of a terrifying journey. “The entire sea, all along the island, was covered with American vessels and ships,” she recalled. The sugar cubes did not last long. Within weeks of their escape, food became scarce. When hunger left one of Iha’s nieces crying uncontrollably, her family was instructed by Japanese soldiers garrisoned nearby to kill the child because she was making too much noise. Duke Wieden left the Navy after the war, had two more children — Ken and Sherrie — with his wife, Violet, who later died from a stroke. In 1995, he married Carolyn Browder and they merged families. The couple spent 17 years together. After enduring heart attacks and dementia for nine years, Duke Wieden died Feb. 20, 2012. 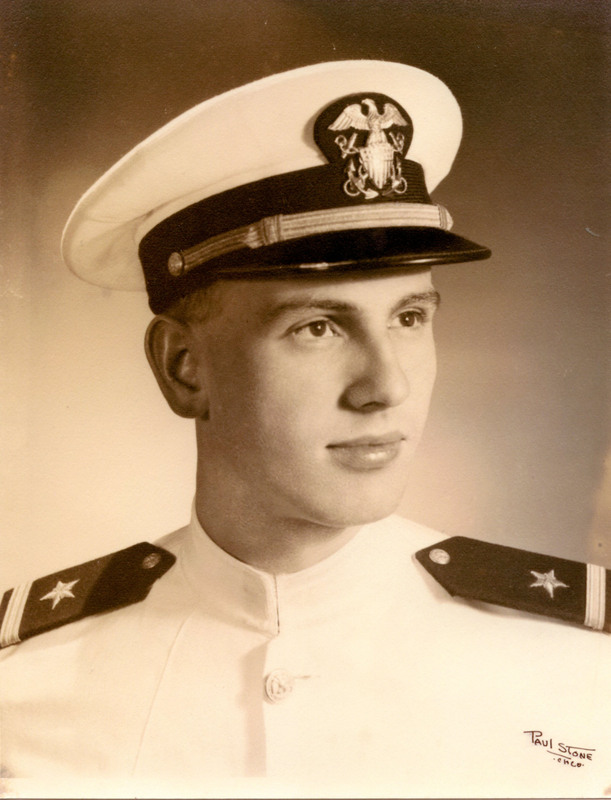 A few weeks after the funeral, Ken Wieden decided to open his father’s Navy trunk, which had sat in a basement, unopened, for more than 60 years. He found uniforms, photos, mementos and the Okinawa album, damaged but full of images. He took it to his stepmother, but she had no idea what it was. Unsure where else to turn, she called Anderson. It turned out that he was with Wieden the day he found it. He explained how upset Wieden had been, and that he had hopes of returning it to its rightful owner one day. That resolve became her own. Carolyn’s son, Lee Wall, and his girlfriend jumped at the chance to help. Sophie Lee said she could translate some of the Japanese in the album and identified a few very common names, but little else. The trio got in touch with an Okinawan government official, but never got an answer about the names. Wieden’s wife carefully removed the photos from the moldering album and cleaned each one. She kept them in order and placed them in a new album. Weeks turned into months without progress. One day, she expressed her frustration to her guitar teacher, Rene Berblinger, who said he had friends who could translate Japanese characters. Within weeks, she had a page-by-page translation, including the name and address of the album’s owner: Mitsuko Sunabe of Chatan, near where Duke Wieden came ashore so many years ago. While having coffee at his favorite spot in Portland, by sheer coincidence, Rene met Erik Lundberg, who was visiting from his home on Okinawa. Excited to help in the search, Lundberg offered to do some legwork on the island. Lundberg recognized an organization logo on the clothing of children in several photographs. With help from the Chatan city offices, Lundberg got in touch with the Irei Association, a youth group. Erik showed members of the group photocopies he’d made of the album pages. A man there recognized the names and a person in the photos. Another woman recognized herself. By October, Lundberg met with Mitsuko Sunabe’s nephews, who meticulously compared birth certificates, dates, faces and names. By Nov. 2, they confirmed that the album belonged to their aunt. Iha Sunabe, with nephews Katsuhide and Nakamura and relatives of former Irei Association members, waited in the group’s new building to meet the Wieden family. They gathered around, pointing out faces they recognized in dark, blurry photocopies of the album’s pages. Carolyn Wieden led the way in, grinning, and introduced herself to Iha Sunabe. Before the album changed hands, Dan Wieden, Duke’s oldest son, and his stepmother gave thanks to the Sunabe family. “It does seem as if something magical is happening that brings us together,” he said. Katsuhide Sunabe explained that since the album features so many members of their former community — Irei village is now Camp Lester — the album will stay in the Irei Association building for all to enjoy. The Wiedens also returned the original binding that once housed the photos, and they gave the family a new album with the same photos, blown up into higher resolution, to keep in their home. Lastly, they included an album of their own family, so the Sunabes could know a little about Wieden. The group ended the ceremony with a formal toast in Japanese tradition. They gathered at Lundberg’s home for a lunch while they shared stories about their lives and celebrated the album’s return. “It must have been some kind of destiny,” Iha Sunabe said.